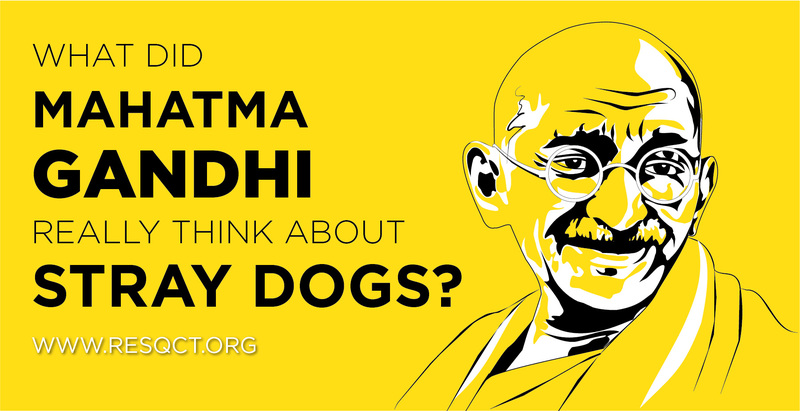 RESQ Charitable Trust - What Did Mahatma Gandhi Really Think About Stray Dogs? Free roaming street dogs evoke one of three reactions from most people — affection, tolerance or intolerance. The thought of the country's legalisation/policy changing to the ‘culling of innocent street dogs’ frightens or angers almost every single person who loves street dogs. There is much debate about what works and doesn’t work, statements and studies published by large institutions, NGOs and global organisations. The issues lie in large entities (governmental and non-governmental) stating ‘the solution’ and proper implementation of it. The disconnect between the two is essentially what has led to the problems that public face today and the unnecessary suffering that free roaming dogs are put through. We are led to believe that in the end, only one can benefit - either people or the animals. It results in a debate, invariably with two teams on opposite sides. One believes that we must tolerate the attacks on people, wildlife and Rabies deaths because ‘the dogs exist on the roads because of conditions we humans have caused’. The other team believes that irrespective of how it got so bad, there is a problem that stands ‘today’, and the solution for it is that they should be culled in interest of Public Health and Safety. While we are discussing about the dog problems of ‘today’, here’s what Mahatma Gandhi wrote about stray dogs in his paper Young India in the 1920s. He is considered the epitome of ‘ahimsa’ and was deeply inspired by the teachings of Gautam Buddha. Both believe that all living beings are sentient and that all life forms should be protected and not meted out with harm or violence. Gandhi, in his letters, wrote about homeless dogs and all over the world, societies have implemented dog control based on the principles that he advocated almost 100 years ago now. Reading the letters below without rational thought may anger you because you may think ‘Gandhi thought all stray dogs should be killed!! !’ but the fact is that he emphasized upon ‘responsible animal ownership’ and focusing on the reduction of human-animal conflict, where one doesn’t benefit at the cost of another. Please note that I neither endorse nor condemn Mahatma Gandhi’s views on this subject. I’d love to share my own personal take on this, but I’ll leave that discussion for another day. Today is Gandhi Jayanti, you can read what Gandhiji wrote and feel free to form your own opinion! A mill owner in Ahmedabad, Ambalal Sarabai, had 60 stray dogs killed outside his mill. Being a Hindu, he felt remorse over his actions and went to Gandhiji. When Gandhiji approved of his deed a huge controversy arose. The Ahmedabad Humanitarian Society and many other people asked him how he, the apostle of “Ahimsa” (respect for all living things and avoidance of violence towards others. ), could approve of the killing when religions like Hinduism and Jainism prohibited the taking of life. It is then that he used his paper Young India to explain what true Ahimsa really meant. “If they really want to be humane they should finance a society to keep these dogs. But since neither the State nor the humanitarians care for these dogs driven mad by hunger and thirst, it is kinder to destroy them.